Some instructors felt "uncomfortable and intimidated" to approach the topic. 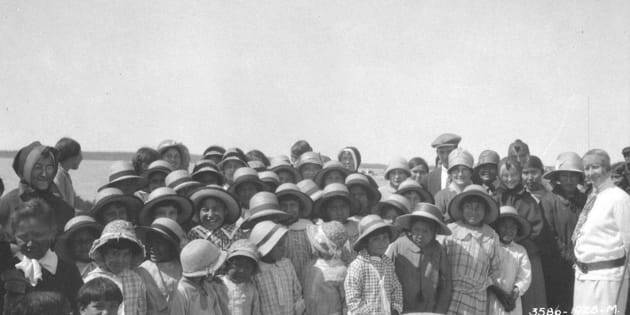 Students assemble in formal attire outside the Fort Resolution Indian Residential School in Fort Resolution, N.W.T. in a 1928 archive photo. EDMONTON — A study suggests that while teachers may want to instruct about residential schools and include Indigenous culture in their classrooms, they don't feel confident enough and are nervous about saying the wrong thing. Students walk on the driveway between two totem poles at St. Michael's Indian Residential School in Alert Bay, B.C. in a 1970 archive photo. Her report, which was published in the International Indigenous Policy Journal, recommends that schools use "Indigenous coaches," who she says were successfully used as a resource for teachers during a trial summer program at one Ontario school. "There were educators I met who didn't know about residential schools. They didn't know about Indigenous people in Canada, Indigenous culture and heritage and history," Milne said during an interview. "Then there were teachers who knew a bit about it but still were unsure how to incorporate it into their classes, and maybe were too uncomfortable, and so didn't." "The problem is that when you have people that are uncomfortable and intimidated, the result is that we have educators that may not be doing it at all." The Truth and Reconciliation Commission's report into residential schools made several recommendations aimed at incorporating Indigenous history and culture into curricula for all students, including age-appropriate instruction about the schools. Some of the recommendations have been endorsed by provincial governments, which control education, and teachers' unions have posted articles on their websites with examples of ways educators can include Indigenous culture in everything from social studies to science. The British Columbia Teachers' Federation in June launched a guide for teaching about residential schools. It includes the short life and tragic death of Gladys Chapman, a child from the Spuzzum Nation, who died of tuberculosis at age 12 in Kamloops Indian Residential School. But Milne said it's hard to take something from a document or a book and implement it confidently. Indigenous parents who were interviewed for Milne's study were open to non-Indigenous teachers talking about Aboriginal culture, but said teachers sometimes misappropriate or incorrectly present information, sometimes lump groups together or make generalizing statements. Melissa Purcell, supervisor of First Nation, Metis and Inuit education with the Edmonton Public School Board, said schools within that district have consultants to provide support on how to build relationships with elders, knowledge keepers and cultural advisers. Some of the work involves helping teachers with culturally respectful terminology. The office also provides assistance with how to teach about residential schools. "Some of our staff are in the very beginning stages where they're just becoming aware of the importance and significance of why we do this work, and then some are becoming more aware and are keen to find innovative ways to weave it into their classrooms and school environments," Purcell said. Fred Hines, principal at an Edmonton school with mostly Indigenous students but a number of non-Indigenous teachers, said professional development, along with support, is key. "It's a transition. It's not like a real 'right or wrong,' but if there's anything that's really culturally sensitive, that's where you bring in your experts," he said.